There are not a lot of reasons to visit Vista (a northern San Diego County suburb) in my humble opinion. Why go to Vista when central San Diego has so much to keep me entertained and well-fed? This was until recently, when Rocket Fizz opened up at a Vista Village. I was first introduced to Rocket Fizz by my good friend, Jody. She, like me, enjoys sweets and soda and we both fawn over squirrels. There have been occasions where we’ve met up in her hometown of Burbank to catch up and indulge at Porto’s Bakery. 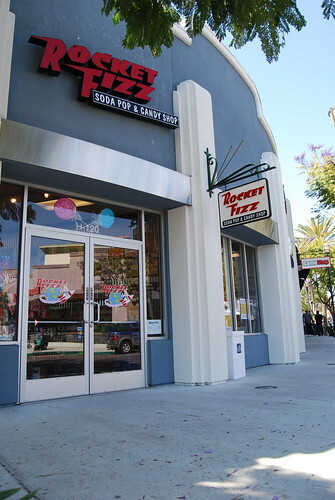 It was during one of those visits that she informed me about Burbank’s Rocket Fizz. A location opened up more than a half a year ago here in San Diego. Vista to be exact. 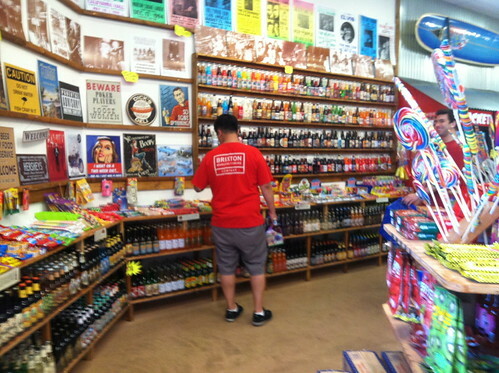 Rocket Fizz models itself after an old-school sweets shop. 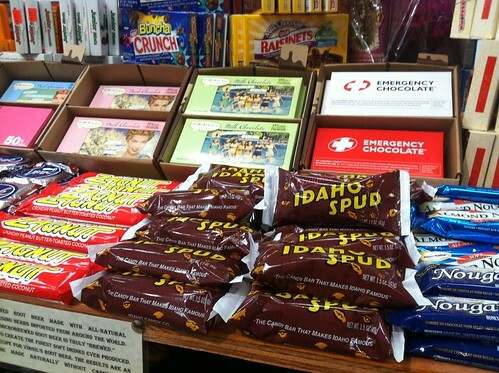 Replica signs adorn the walls, and unique and hard-to-find sweets stuff every nook and cranny of this shop. The sodas aren’t anything to shrug at either. You can find their house brand soda (with flavors such as Mud Pie and Green Apple Jalapeno), Michigan’s beloved pop Faygo, as well as RC Cola, Dr. Brown, Jones Soda, etc. There are far too many to mention but if it’s available, there’s a good chance it’s here. Regardless of brand, all the soda prices are the same. A single bottle is $1.99, a pack of four is $6.99, six bottles is $8.99 and a dozen is $16.99. 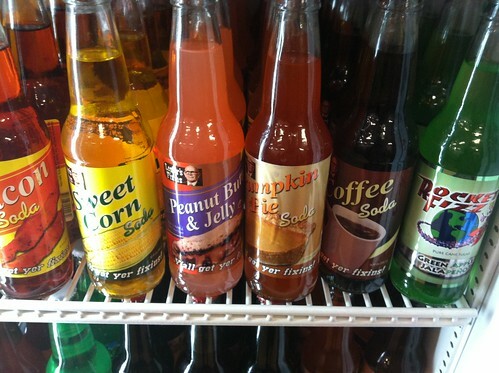 All sodas are in glass bottles. While not a deal on its face, what Rocket Fizz offers is a huge selection in one place and an opportunity to mix and match as you please. No one will question you buying sweet corn soda with Judge Wapner’s root beer. 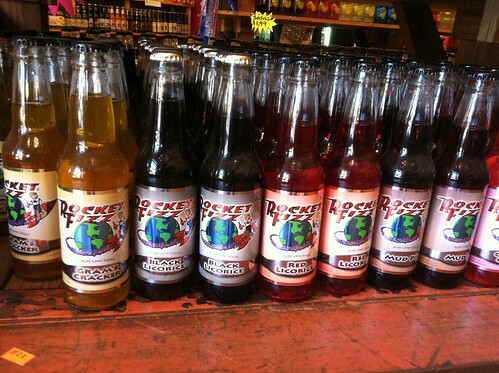 Rocket Fizz has locations in Arizona, California, Colorado, Indiana, Nebraska, Nevada, Tennesee and Texas. But for me, it’s the San Diego location that really matters. Their website says they are opening one in the Gaslamp district in Nov 2012. I predict a packed house during SDCC. 45 miles doesn’t seem that bad if you could combine it with another trip along the way. Yes, they would make a killing at SDCC! What a cool place! Reminds me of Pop Culture in Vancouver, WA, except this place has candy and Pop Culture had the sodas and junky food (burgers, tots, and dogs). We’ll have to check out this place one of these days. I want to see if they have the Doc Brown celery soda! it’s not as bad as it sounds! Yeah, I can’t imagine what Doc Brown celery soda would taste like. I’ve seen it but never had a desire to try it. I imagine it would be salty?? not really salty but vegetably (i just made up that word). the soda tasted good with hotdogs actually (we bought it at Hot Doug’s in Chicago, where Bourdain had a foie gras dog). 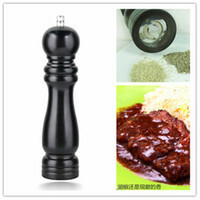 Thanks for the plug Darlene. Next time you’re in the neighborhood, be sure to stop in and say hi. I’ll have a Dr. Brown’s Cel-Ray for you (I always have it in stock), my treat! — Rob, Head Fizzateer.